Household faucets are constantly exposed to moisture, running water and extreme temperature changes. 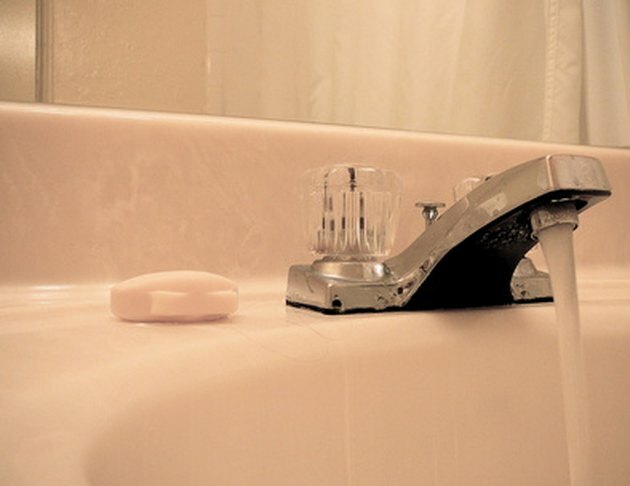 Sealing around the base of a faucet can help preserve its condition despite these factors. An effective sealant, such as silicone caulk, is often applied to the faucet in order to prevent rust, mold and leaks as a result of regular wear. This compound is an adhesive sealant that creates an airtight, waterproof bond to the exposed seams of the faucet assembly. Faucets can be sealed with silicone caulk. Clean the area around the base of the faucet with a commercial detergent or bleach. The targeted surface should be free of contaminants in preparation for the sealant. Snip the tip on a tube of silicone caulk with a pair of scissors. The resulting hole should be no more than 1/4-inch-wide to distribute a controlled amount of the sealant. Puncture the seal inside the nozzle using a stiff wire or construction nail. Load the tube into a caulking gun with the nozzle pointing away from the trigger. Insert a bead of silicone into the joint between the faucet and the surface on which it is mounted, whether it is a wall, sink or bathtub. Draw the tip around the base of the faucet until an even seal has been applied. Glide a plastic spoon or craft stick along the seam to smooth the caulk for a neater seal. Allow it to cure for a full 24-hour period before running water through the faucet.